Located mightily and beautifully on the slopes of Northern Himalayas the 1,300-year old capital city of Tibet, Lhasa is an utterly unique destination. The most popular location in the country for travellers, it’s no surprise given the sights on offer here! From the breathtaking views of Potala Palace to the pilgrim crowds around Barkhor Street, this city really is a non-stop sensory delight. At an elevation of 3500m however, Lhasa is not for the faint-hearted! A city among the clouds in every way, travelling here can be a heady experience, offering a rich opportunity to enjoy both spiritual and adventurous experiences aplenty. Barkhor Street, located at the centre of the capital is the oldest street in Lhasa. Although it’s most famous among travellers for shopping and tasting local foods, for Tibetan people it is known as the ‘holy way’. 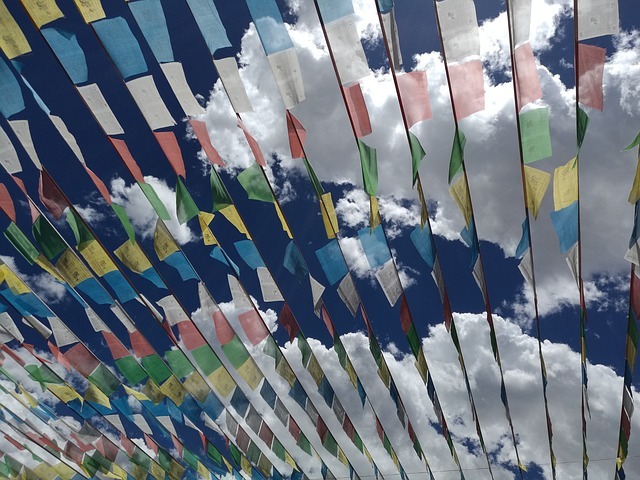 Basically, a road surrounding the famous Jokhang Temple, Barkhor Street is the place where many Tibetan people perform their kora – an act of circumnavigating a sacred site in a clockwise direction. This is a particularly common sight in the evening. Tourists can also make their Kora around the temple, and doing so is one of the best ways to get a small understanding of the rich, mystical culture that is very much a way of life in Tibet. Afterwards, visitors can then enjoy the local sights, shops and small tea houses of this fabulous part of Lhasa, as well as the market stalls… of course! 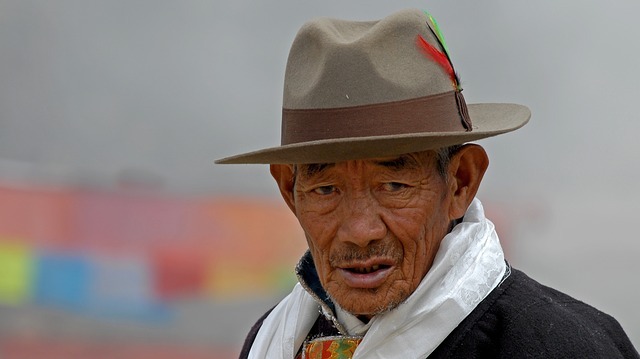 Some of the items you will find in the markets of Barkhor Street include Thangkas, Tibetan housewares, artworks, and a lot of handcrafted prayer wheels, prayer flags, quilts, hats and carpets. There are also around 35 pavements surrounding Barkhor Street and the most popular way to explore these is by walking or cycling. During festivities, you can capture some good images of local celebrations in this area too. On the whole, exploring the Barkhor Street is a must-do in Lhasa due to its historical and cultural significance. For refreshing your body, mind and soul in Tibet, nothing is quite like a warm cup of sweet tea, drunk in the cozy little teahouses of Lhasa. Indeed this is a local rite of passage (known as ‘Qabadi’ in Tibetan) and is a must-have experience for all travellers in this country. Every day you will find a lot of old people relaxing over a cup of sweet tea in Lhasa and discussing everything from politics to childhood tales. Tibetan Buddhists also use the teahouses as resting areas and you can often find them spinning prayer wheels in one hand and enjoying tea with the other. Visiting these teahouses in Tibet’s capital will give you an amazing insight into locals in both their religious and secular states. Along with the sweet tea, the teahouses also provide few other beverages and dishes like butter tea, noodles, yak meat, stuffed steam buns, beef noodles and bean jelly – all of which are worth trying! Some of the popular teahouses in Lhasa are CangGusi Sweet Teahouse, Luo Qu Sweet Teahouse, Guang Ming Sweet Teahouse, Canggu Nunnery, Ni Ma Teahouse and Shan Dong Teahouse. The atmosphere in each and every one of these is wonderful, especially during peak hours, when they come alive with vibrant chatter, sweet aromas and human warmth. The Lhasa teahouses are one of the most charming aspects of Tibet and cannot be missed during your time in the capital. 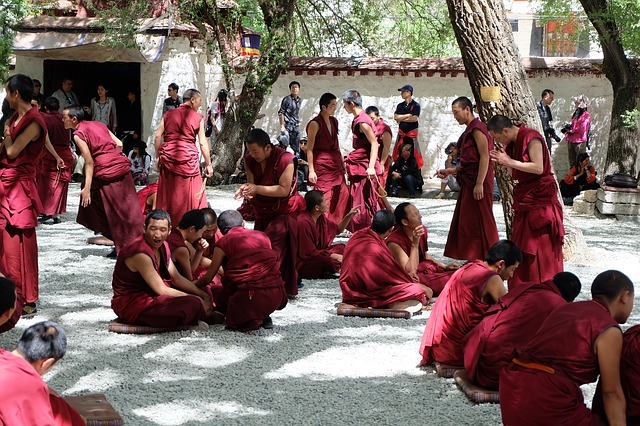 The debating monks of Sera Monastery are one of the most popular highlights for many visitors to Lhasa. Built in 1914, Sera Monastery is one of the 3 main Gelugpa sect Monasteries in the capital and is located on an attractive hillside. 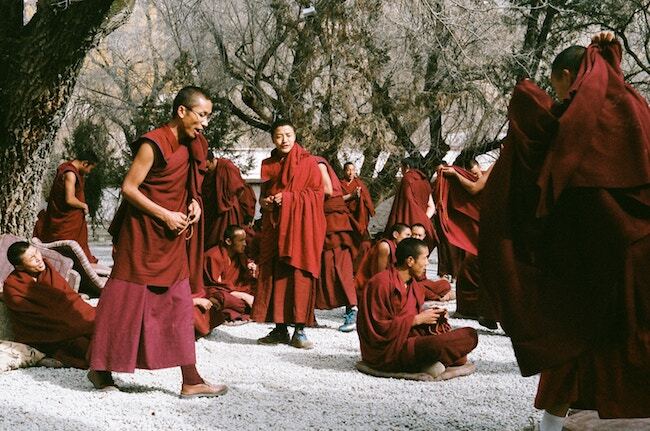 This monastery is not only a religious centre, but also an important educational centre. Each afternoon, from Monday to Friday, you will be able to see the loud and intense debates that are held in the courtyard of this monastery between older and younger monks. Older monks question and challenge the knowledge of the younger monks on various subjects and clap loudly after every question as a signal for the younger monks to reply. The debates continue for roughly 2 hours, during which time the monastery is filled with noise, dramatic claps and some highly energetic monks! That’s because (and you’ll quickly notice) that the monks don’t just use their voice during the debate. Instead, they use their whole bodies to emphasize their points and many move strongly and with vigour during the questioning. 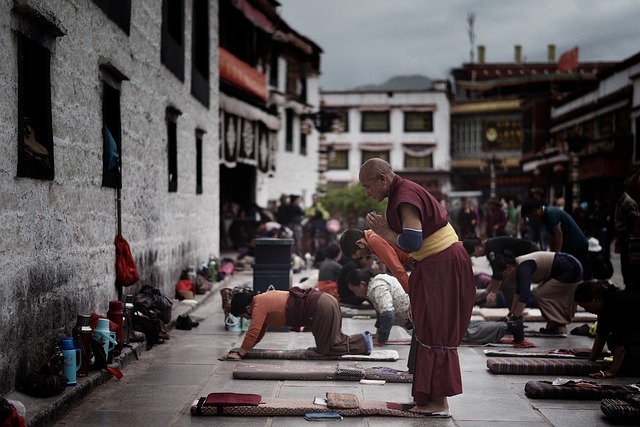 Both fascinating and entertaining, these debates are an integral part of the learning process for the younger monks in the Tibetan tradition and for visitors they provide an incredible cultural experience. Held under the blazing sun 5 days a week at 3pm, this is one of the oldest traditions in the monastery and is a sight not to be missed. Before the debate, you can explore the prayer hall, great assembly, colleges and chapels of the monastery, making this a superb Lhasa day trip. The view of a 13-story fortress on top of a 130m high hill is one of the most magnificent views in Tibet, if not the world! Located at an altitude of 3750 m on top of Red Hills, the UNESCO-listed Potala Palace is the highest historical site on earth and combines an amazing location, beautiful architecture and heritage. It’s perhaps no surprise therefore that the Potala Palace is the winter residence of the Dalai Lama. Since it is located at such a high altitude and a lot of climbing is required to get up there, it’s a no-brainer that the views from the top are sensational! There are actually 2 palaces up there – the Red Palace and the White Palace, which between them have over 1000 rooms. Only 20 or so are open for tourists, but even inside these few, you will see some stunning paintings, religious treasures and ancient Tibetan architecture. The white walls, golden gates and red rooftops of the Potala Palace, set against a background of soaring mountains is a sight you really can’t miss when you come to Lhasa. 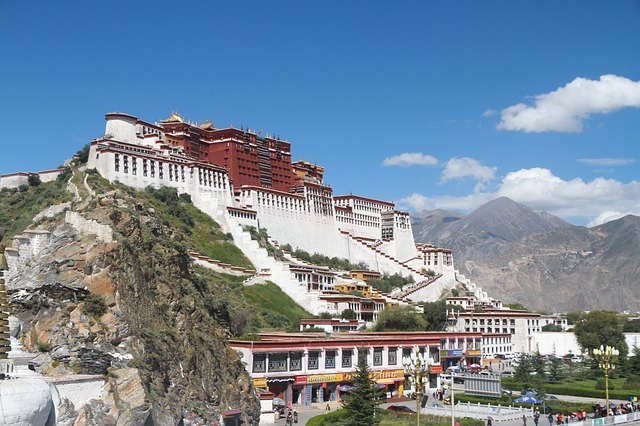 Neither is the full picture of the palace, which you can get from Chikpori Hill or Tibet Peaceful Liberation Square. At night, the Palace becomes even more beautiful with twinkling lights outlining it against the night sky. Back in Barkhor Street, the Jokhang Temple is considered the spiritual centre of Tibet and is therefore hugely important to the people of Lhasa. Built in the 7th century, it has 4 stories and displays a mix of Tibetan, Nepalese and Indian architectural styles. Even though it is not the oldest temple or monastery in Tibet, this temple played a huge role in the development of Buddhism in the country, which is why it’s still so important. One of the main attractions of the temple is the life-size (5 foot) image and statue of 12-year old Jowa Sakyamuni, which was given as a dowry to the king by Princess Wenchen. There are also hundreds of other statues, images, murals, stupas and artworks in the temple and as you go higher and higher, you’ll also find platforms to enjoy the incredible views over Barkhor Street. And then, from the rooftop, you can even see the beautiful Potala Palace in all its glory! Jokhang Temple becomes especially lively during festivals like the Tibetan New Year when the whole city gathers here to celebrate. There’s no question that visiting this deeply spiritual site, will give you a key opportunity to see just how much Buddhism is an integral part of everyday life in Tibet. 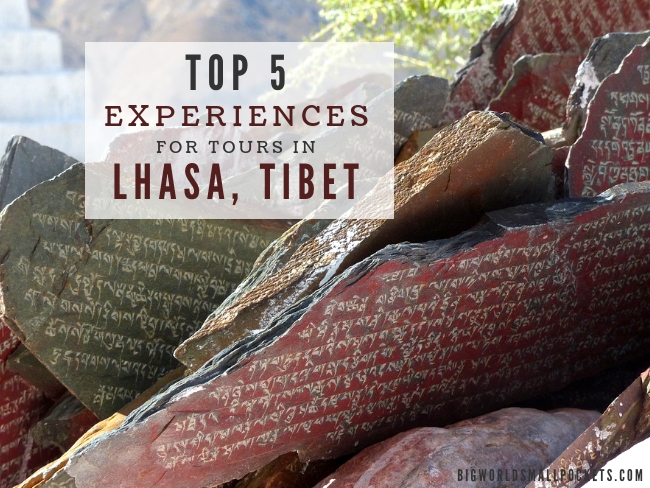 There are just so many unique attractions and experiences to be had in Lhasa that it was hard to pick the top 5, but I’ve tried to do my best! A totally amazing place, this is a city where you truly can experience spirituality and adventure at the same time! I did all of these things! I loved reading your recap. I am just starting a travel/lifestyle blog and am looking to established bloggers for inspiration. Your post is a great reference. Isn’t Tibet amazing? Absolutely Kimberly! Delighted to hear you are starting a blog, sounds like you enjoy visiting some interesting countries!